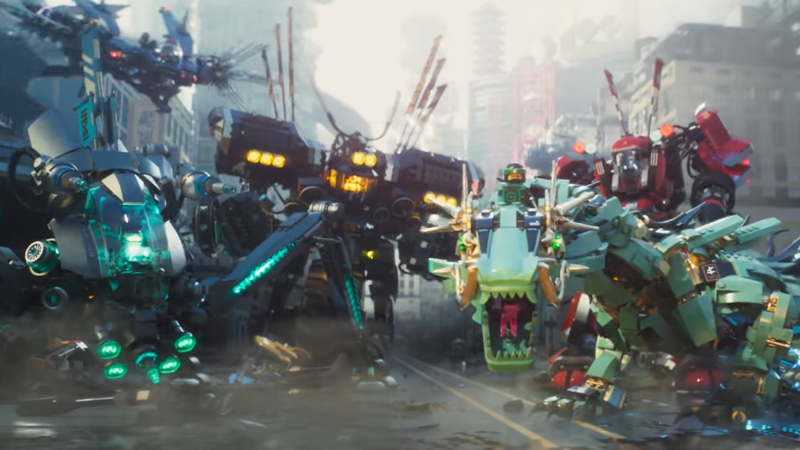 Unlike Lego’s past cinematic efforts with its general brand and most recently Batman, I’m not super familiar with Ninjago, the line of Lego sets that will star in the next Lego movie. But apparently there aren’t just ninjas, but lots of giant robots too, and that’s quite alright by me. The Lego Batman Movie isn’t even in theaters yet, but this morning Lego and Warner Bros dropped the first footage from the next film in the franchise, The Lego Ninjago Movie, due out this September. Like The Lego Movie, it’s based on original Lego properties rather than one of the myriad licenses the toymaker controls—in this case, Ninjago, which first hit shelves in 2011. It’s a lot of typical ninja-type stuff—there’s even Jackie Chan as the sensei of the team, Master Wu—but also a lot of goofy giant robot action, as the unruly team of ninjas face off against the evil warlord Garmadon. Who, turns out, is the absent father of main character Lloyd the green ninja. So you’re getting your Lego ninja action with a side order of family drama, to boot. The Lego Ninjago Movie is due out September 22, 2017.